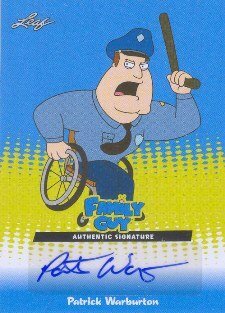 It has been a few years since a new Family Guy set has graced shop shelves. This was in part due to Inkworks, the former license holder, going under. 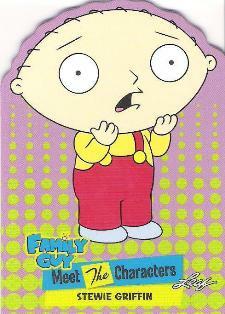 Leaf snagged the license and has picked up where Inkworks left off with Family Guy Seasons 3, 4 & 5. Rather than going the pack route, it's been released as a premium box set with each box containing a full base set, an autograph and two inserts. 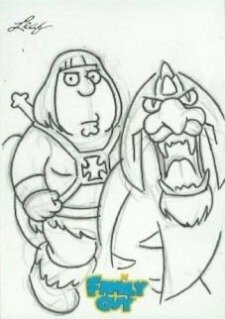 Sketch cards, inserted in approximately every third set, have been done by the show's animators. 50-card base set covers third, fourth and fifth seasons, picking up where the Inkworks sets left off. 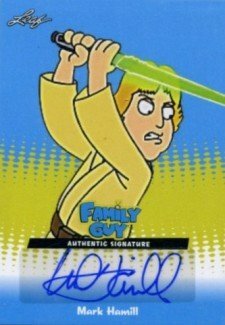 Autographs (one per box) include a handful of main cast members as well as a bunch of pop culture icons, like Mark Hamill and Carrie Fisher from Star Wars, Patrick Stewart from Star Trek: The Next Generation and Alfonso Ribeiro of Silver Spoons and The Fresh Prince of Bel Air fame. 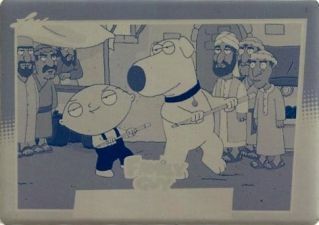 Sketch Cards from the show's animators inserted four per case (1:3 boxes). Random hot cases contain 12 sketch cards. 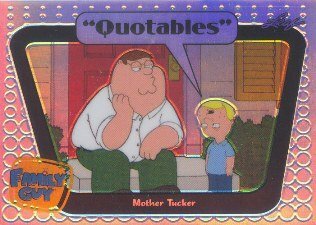 Quotables are inserted one or two per box and feature metal technology. Collectors can also look for Refractor parallels numbered to 70. Meet the Characters (10 cards, 1:4 boxes) feature die-cut takes on the show's most popular characters.